Successfully Added 6 Piece Fingertip Gyroscope Pack - ABEC-7 Bearings, ABS Material, Reduce Stress + Anxiety, LED Lights, Random Colors to your Shopping Cart. These popular desk toys come with built-in LED lights so that as they spin they will give off a tranquil and relaxing light. Ease away your stress and anxiety, push out those negative thoughts and relax wherever you are with these Fingertip Gyroscopic spinners. This Pack of 6 comes in random colors (blue, white, green, orange, black, yellow) and with LED lights will make your day shine. These gyroscope spinners are well known for reducing stress levels and are frequently recommended by psychiatrists to treat and control issues such as OCD, ADHD, and PTSD. If you're working in a high-stress environment or just want a cool desktop to wow the office then these cool electronic gadgets are the perfect item. Made from a tough ABD material and with high-speed ABEC-7 bearings these fingertip gyroscopes come in a pack of 6, allowing you to share the fun with workmates, friends, and family. 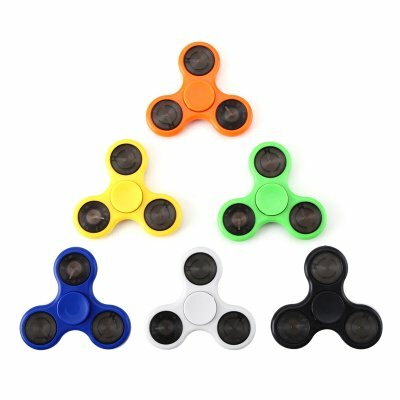 Now you can spread the calming influence of these fingertip spinners that have the added bonus of focusing the mind while relaxing your body. This 6 pack of fingertip gyroscopes comes with a 12 months warranty, brought to you by the leader in electronic devices as well as wholesale electronic gadgets..